Help me ODeck! You're my only hope! 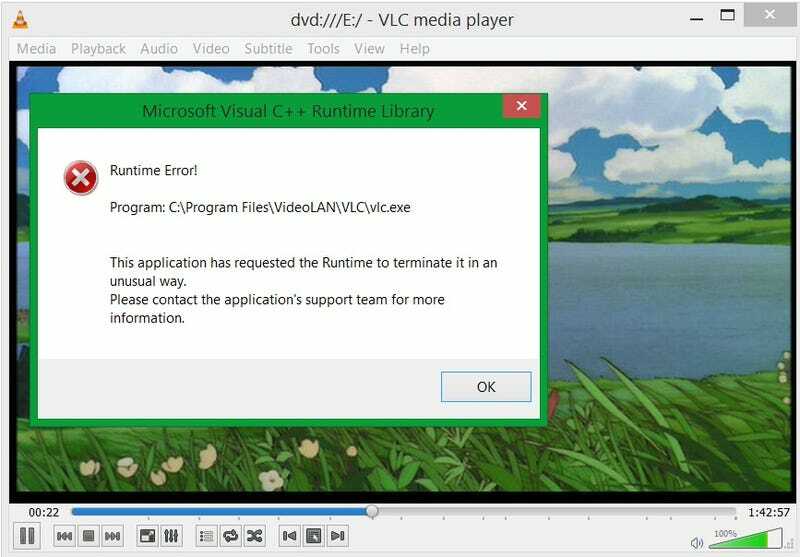 This error appeared in VLC yesterday. I got a new computer (Win 8.1) two weeks ago and VLC had been running fine for both .avi/.mkv files on my computer and playing DVDs. But last night I got this message when playing a DVD, and it hasn't stopped since. Playing files from my computer is still OK. So now I'm just angry at technology since I'm not someone who can figure out what to do to fix it. I've googled the problem but the forums that discuss this problem aren't any help (and are from a few years back). I've uninstalled VLC, restarted my computer, and installed a version from a few months back (just to make sure it wasn't this version of VLC), and that didn't help either.